Okay, all "to be or not to be" aside-- can you imagine how intimidating it would've been to have taken an acting class alongside individuals such as Ben Kingsley (I mean Gandhi himself! ), Ian McKellen and Judi Dench? So with this in mind, thank goodness that Playing Shakespeare-- the 1982 legendary in-depth, nine episode master class led by John Barton on behalf of the Royal Shakespeare Company has now been made available for Bard buffs to enjoy in the privacy of their own home. Recently it was served up as a four disc, slim-packaged exquisite collection from Acorn Media and Athena that also comes complete with a twenty page viewer's guide which offers more avenues for learning, history, points to ponder and highlights of the episodes as a sort of CliffsNotes version to the originally lauded companion text released in tandem with the London Weekend Television production. Furthermore, it's a wonderful way to appreciate the renowned and still so relevant production that was dubbed "required watching" for actors by The New York Times. 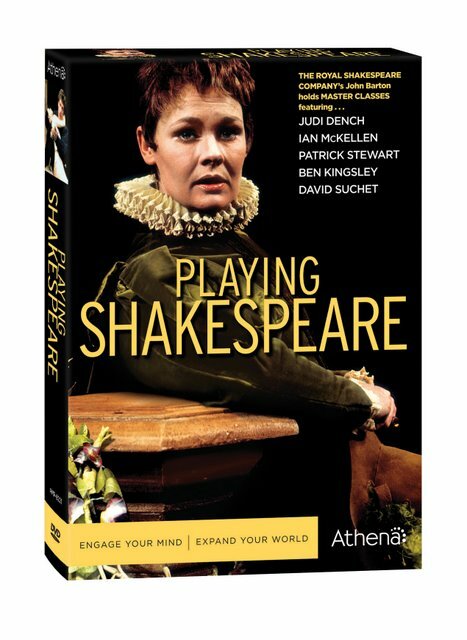 Still, of interest for more than just Shakespearean inclined actors-- whether you have a thing for iambic pentameter or are just simply interested in the tremendous creative output of Shakespeare's versatile plays (both tragic and comic alike)-- it's intellectual nourishment of the highest order. And likewise it makes an ideal companion work to more modern interpretations from my favorite Shakespeare professor, Mr. Kenneth Branagh to Al Pacino's fun documentary Looking for Richard. Admittedly, on the surface it's safe to say it's even more pretentious than an entire season of the knowledgeable, brainy, but nonetheless amusingly SNL mocked stylings of James Lipton on our very own Actor's Studio (based on the Stanislavski system, a.k.a. "method acting" in its New York City setting). And it's additionally hindered by the fact that some of Barton's episodes and discussions feel a bit repetitive. Nonetheless it's a great deconstruction of the various choices one makes when taking on a role in a Shakespeare production and a thorough analysis of the texts at the same time. Having seen a majority of the series in a random order sporadically during the last fifteen years via not just television (I'm guessing PBS, Bravo or BBC America perhaps) but academia-- in everything from high school acting classes to collegiate literary studies on Shakespeare and master's level humanities coursework-- it was thrilling to finally take it all in the correct order when I could simply view it as a work instead of painstakingly taking notes for use in a required paper or for a scene study. Breaking down the works with Barton's ongoing thesis that Shakespeare planted clues (or cues) throughout the text that are meant to help the actor and offer a guide for the the Bard's true intention on how a work should be played-- throughout the series Barton and the cast of twenty-one acclaimed and award winning actors play intellectual detectives. Additionally, they weigh some of the inconsistencies in his use of short lines followed by long speeches, controversies surrounding the characters (for example Shylock in Merchant of Venice) and try to avoid overplaying the scenes as well as using iambic pentameter in too mannered of a style. By discussing the challenges of tackling the centuries old works as modern method trained and/or naturalistic actors, it makes one realize just how daunting it would be to take on the texts we know so well that-- as Barton acknowledges in the opening of the set-- over one thousand books and articles are written about the playwright and poet every single year. Although it's far easier to say whether or not something is good or bad (acting-wise), it's a different obstacle altogether to dissect why we make those judgments as this highly talented group dissects their reasoning regarding how to choose the approach to deliver a particular line (or even simply one word) from an infinite number of options. And while Barton is the one running the show, it's especially great to see the way that the actors (or more specifically Ian McKellen routinely ask him to define or clarify words and phrases) in order to test their own theories and opinions as they go back and forth. Despite Barton's earnest wish that he wouldn't do too much directing during the series nor have the members of the Royal Shakespeare Company do more talking than acting, both of these well-intentioned promises are broken early on as the one weakness the collection has is the fact that it comes off as "much ado about nothing," or quips aside, far too much conversation about what they think and not enough actual scene work that allows them to transfer these thoughts into action. However, when the characters-- even in modern dress-- deliver a line like the wondrous McKellan in a multitude of ways to illustrate how something can endlessly be interpreted, that's when the series shows us the glory of the best Shakespeare company in the world. While all of the cast-mates have their moments, for me, the major "must see" segment was witnessing two extremely different takes on Shylock by David Suchet and Patrick Stewart as despite the fact that Barton had directed both men in their interpretations, neither actor had seen the other one perform it. First discussing the alleged anti-semitism of the play which becomes a matter of personal significance for the Jewish Suchet who recalls getting horrific letters from Americans questioning his decision to act in such a work-- he and Stewart agree that you can't judge the play in terms of the twentieth century holocaust and it's interesting to see the way the two men address the Jewish religion in their respective characterizations. While to Stewart, Shylock is "an alien" and "an outsider" who happens to be Jewish, to Suchet, Shylock is an outsider "because he is Jewish" and his passion comes through at once in their scenes together as they trade off. And although Stewart is a talented actor, to me it's apparent right off the bat that his approach to making the character so overly broad (to the point that at one moment he slips strangely into what sounds like a Scottish accent) is a grievous error for the work. Essentially his take makes Shylock a spectacle whereas Suchet moves us to such an extent-- although he works hard against playing scenes like "hath not a Jew eyes" for sheer sympathy-- that I realized I would never look at the man most famous for his portrayal of Agatha Christie's Hercule Poirot the same way ever again. Simply put, I wanted to start a Suchet fan club and wondered why on Earth he hadn't broken free to the same level of stardom as McKellan and Kingsley (both of whom look so amazingly young you'll do a double take in episode one). A wonderfully valuable treasure for fans of Shakespeare and filled with great debate on his most famous texts, discussion regarding the significance of the word "time" (which should be said with two syllables) in the work of the Bard, it's safe to say this collection will be a must-own for those who've ever done more than just passively read along with his work in elementary school.